I was out on the streets in Totton and Hythe, before the referendum. 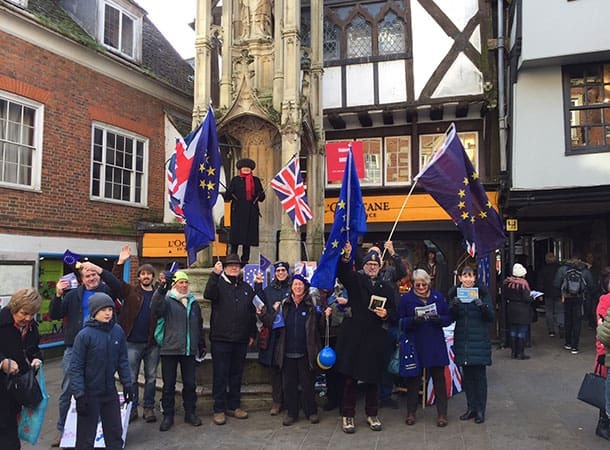 I was out on the streets in Lymington, Winchester and London, after the referendum. I shall be out once again, joining hundreds of other like minded people, exercising our democratic right to protest publicly. I think I have just about killed off all the arguments that suggest the referendum was fair, that it decided the issue once and for evermore, that everyone knew what they where voting for, that it would somehow be anti-democratic to let people have a final say. If our MP’s cannot sort out a Brexit that the nation feels comfortable with and we are risking dire consequences that flow from a no-deal, it is surely time to let people confirm what they want. If a hard, no deal, Brexit is really what people want… they can say so by way of a final People’s Vote. At least it will get us out of this log jam which has virtually shut down government. My own sense, supported by poll results, is that the country has changed its’ mind… but at least a referendum will show one way or the other.